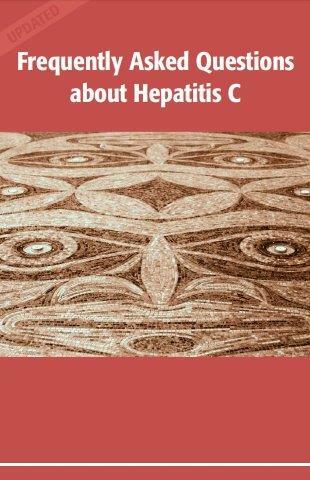 Simple answers to questions most often asked by people with hepatitis C (14 pages). 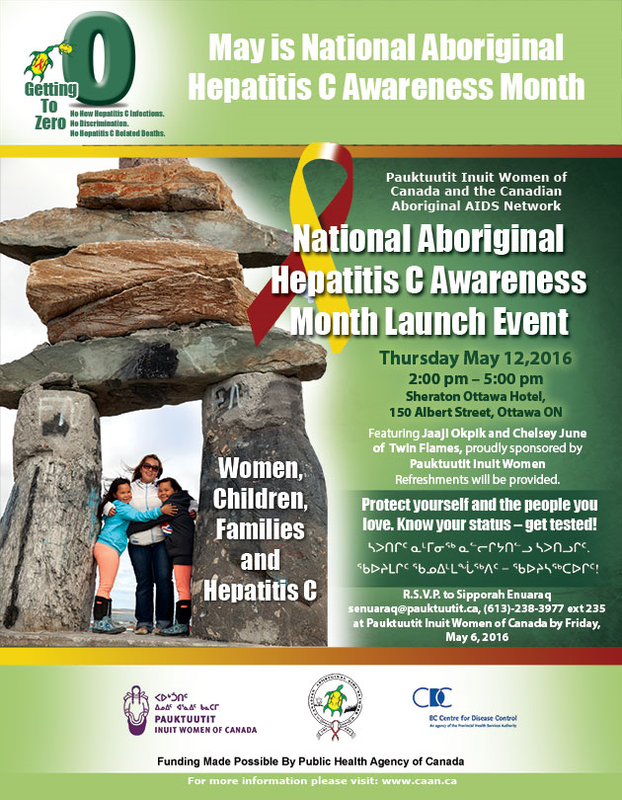 May is Aboriginal hepatitis C awareness month! It’s a virus that can cause damage to the liver, an organ that has many different functions essential to your life. How many people in Canada have it? About 300,000 people in Canada have hepatitis C. That is about 1 in every 100 people. Many people don’t know they have it. Of the estimated 300,000 people living with hepatitis C in Canada, almost half do not know they have it! Can the body get rid of the infection? Sometimes, yes. For every 10 people that get hepatitis C, about three will be able to get rid of the infection in the first six months. Their body attacks the virus and gets rid of it naturally. About 7 will have chronic hepatitis C. That is, they will likely have it for life, unless they get treatment. Yes! With new medications about 9 people out of every 10 who complete treatment may be cured. Rates may differ for those who are also living with HIV. No, there is no vaccine to protect you from getting hepatitis C. You can protect yourself by knowing how it is passed and taking actions to reduce the chance of getting hepatitis C.
If I get hepatitis C, will I know I have it? Unless you know what activities can put you at risk of getting hepatitis C, you will probably not know you have it. This is because most people do not have symptoms right away. Only about 1 in 4 people have symptoms when they first get the virus. Many people do not have symptoms for 10 to 30 years after getting hepatitis C.
This is because the liver can keep doing its job for a long time, even when it is damaged. Many people with hepatitis C are living with more than one condition. This can make it difficult to sort out which symptoms are related to hepatitis C.
See your health care provider if you are having symptoms that you are concerned about. Compare through which body fluids HIV, HBV and HCV can be passed. How hepatitis C is passed? After learning about hepatitis C, some wonder if people they know have it. But, you cannot tell from looking at a person if they have hepatitis C.
This is why it is important to know how hepatitis C is passed and how it is not passed. Then you can take actions to try to protect yourself or others from getting hepatitis C.
…regular day-to-day activities like: coughing, hugging, kissing, or sharing dishes. These day-to-day activities, and others like them are safe. You can get hepatitis C if the blood of a person who has the virus gets into your blood. Some activities are more likely to lead to blood-to-blood contact than others. The greater the chance of blood-to-blood contact, the greater the chance that hepatitis C will be spread. …when people share or re-use drugs or injection drug equipment. If the drugs or injection equipment are used for more than one person, there is a high chance for hepatitis C to pass from someone who has the virus to another person. This is why injecting supplies (like syringes, water, spoons/cookers and cotton) are sometimes supplied free of charge to people who inject drugs. Otherwise, if people share injection equipment they have a high chance of getting hepatitis C.
Because it is so easy for hepatitis C to get into the bloodstream through any kind of injection, all medical procedures must be done using new disposable syringes and sterilized equipment. …when the blood of an infected person comes into contact with another person’s body through an opening in the skin. Although it doesn’t happen very often, it is possible for hepatitis C to spread from a mother to her baby at birth. Can hepatitis C be passed through sexual contact? The risk of hepatitis C being passed through sexual contact is zero to low, but …the risk goes up if blood is present, even if you can’t see the blood. 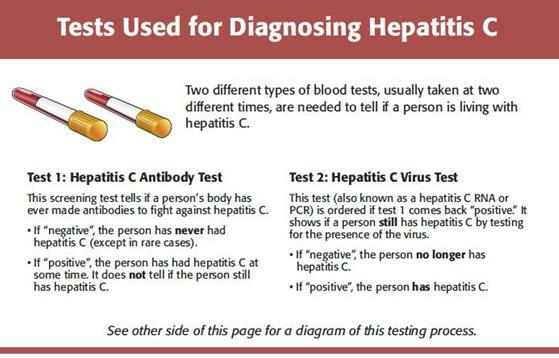 This patient page explains the hepatitis C testing process (with diagram). Discussion checklists for providers to use with patients before/after the antibody and RNA tests. Should I get tested to see if I have it? You should get tested if you have had even one event where hepatitis C could have been passed, whether the event was long time ago or recently. if you had a blood transfusion in Canada before 1992, before blood was screened for hepatitis C.
These are just some examples of risk events. If you are not sure if you should get tested for hepatitis C, talk to a health care provider. Getting your blood tested is the only way to know for sure if you have or do not have hepatitis C.
You can go to any health care provider, like a nurse or doctor, to ask about how and where to get tested for hepatitis C.
How many types of blood tests are often done to find out if a person has hepatitis C? Two types of blood tests are often done to find out if a person has hepatitis C. These tests are usually taken at different times, but this depends on where you live. So it is important to know what these tests mean. What is the first test? If you are getting tested to see if you have hepatitis C, the first test you will get is the hepatitis C antibody test. This test shows if you have ever had hepatitis C. It does not tell if you still have it. What if the first test is “negative”? If the first test, the antibody test, is negative, it means that hepatitis C antibodies were not found and you have never had hepatitis C. You do not need to get the second blood test. What if the first test is positive? If the antibody test is positive, hepatitis C antibodies were found and you have had hepatitis C at some time. This test does not tell if you still have it so you will need the second test. What is the second test? The next test is the hepatitis C virus test (also known as hepatitis C RNA or PCR). This second test checks to see if you are still have hepatitis C.
What if the second test is negative? If the hepatitis C virus test is negative, the hepatitis C virus was not found so you no longer have hepatitis C.
It is possible to get hepatitis C more than once. So you may want to talk to a health care provider about how to prevent getting hepatitis C again. What if the second test is positive? If the hepatitis C virus test is positive, the hepatitis C virus was found. This means you have hepatitis C.
Your test result must be sent to your local public health department so they can count how many people have hepatitis C.
However, your hepatitis C diagnosis is kept confidential. You are not required to tell anyone that you have hepatitis C. You can choose who to tell. 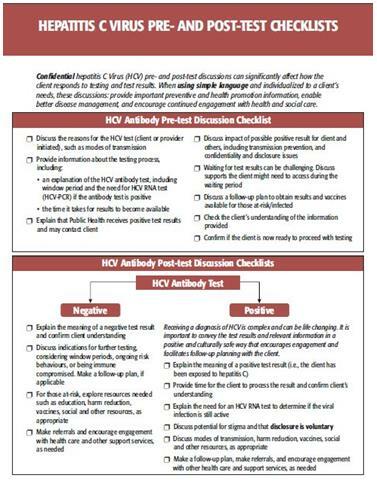 A checklist of questions people frequently ask their health care providers about hepatitis C.
This “personal bill of rights” may help you to speak up for yourself. If I have hepatitis C, what should I know and what’s next? What does hepatitis C do to the body? Hepatitis C can cause swelling and scarring in the liver. After 20 to 30 years, the liver can become quite damaged and unable to work properly. This can cause many different health problems because the liver does so many important jobs for the body. Anyone with signs of liver damage should be checked to see if they can get hepatitis C treatment as it could stop further liver damage. How can I know if my liver is damaged? Health care providers cannot predict who will have liver damage, so it is important to regularly see a provider who can monitor your health. These vaccinations are free for people living with hepatitis C. You can get these vaccinations from your health care provider or public health unit. There are many sources of hepatitis C information such as the internet, friends & family, and health care providers. Information can sometimes be out of date or incorrect. It is important to check out the information and decide if the information is helpful in your situation. When should I see a specialist/or go to a liver clinic? People often see a specialist or go to a liver clinic when thinking about going for hepatitis C treatment. You may need a referral from your health care provider to see a hepatitis C specialist or to go to a liver clinic. With newer drugs that have fewer side effects, treatment may be available from other providers. Also, you may want to speak with a specialist or a pharmacist if you are considering alternative therapies, herbal remedies or traditional medicines. These specialists may be able to determine what ingredients would be safe for you. Do people living with hepatitis C need to see a health care provider even if they feel fine? Yes. They should see their provider every 6 to 12 months. Even if a person feels well and has no symptoms, hepatitis C can still be damaging their liver. Sometimes people newly diagnosed with a disease that can be passed to others do not want to talk about it. They are not sure how others will react. For example, many people don’t know much about hepatitis C, so those living with it worry that friends or family will become overly cautious or afraid of catching it. Stigma happens when somebody is judged or not valued as a person. People with hepatitis C sometimes feel judged or not valued because they have hepatitis C.
Stigma can happen for many reasons; one reason can be fear that comes from a lack of knowledge. People may be afraid because they don’t know about how hepatitis C is spread from person to person, how it affects health or how it is treated. It’s important to get the health care you need but it can be hard to ask for it. 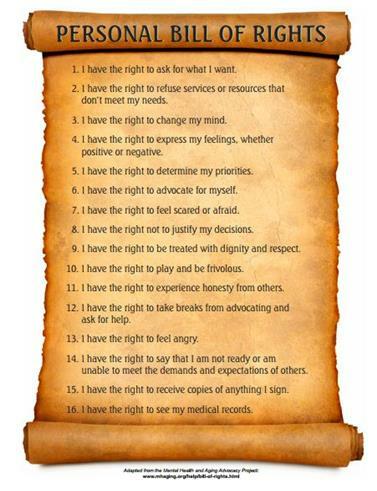 This “Personal Bill of Rights” is one support that might help you to speak up for yourself. A skills building workbook to help people get the care and support they need (25 pages). Learning to balance a chronic disease like hepatitis C with other things going on in your life can take time. You may have to juggle several different priorities all at once. Deciding what to do first and how much time to spend on each thing will depend on your situation. Stay connected. Having a chronic infectious disease can affect your social life and leave you feeling isolated. Figure out who you feel comfortable talking with. It is helpful to have someone who you can talk to about what you are going through and the decisions you need to make. Reduce physical and emotional stress with exercise and eating a balanced diet. Alcohol can speed up liver damage. Talk to your provider about alcohol use, how it can affect the liver and the treatment of hepatitis C, and if you need to cut down on alcohol use. Tell your health care provider everything you are taking. Some people use herbal remedies, other supplements, over-the-counter drugs, or traditional medicines. Some supplements or other medicines can be harmful for your liver when taken alone or with medicine prescribed by your provider. Most people with hepatitis C do not need a special diet. A balanced diet as outlined in Canada’s Food Guide can help maintain health. This includes eating a variety of nutritious food – things like vegetables and fruits, whole grains, meat and alternatives, and milk products. You may need a special diet if you have liver damage. In these cases, speak to your health care provider or nutritionist to learn about what you need to eat and what to avoid. 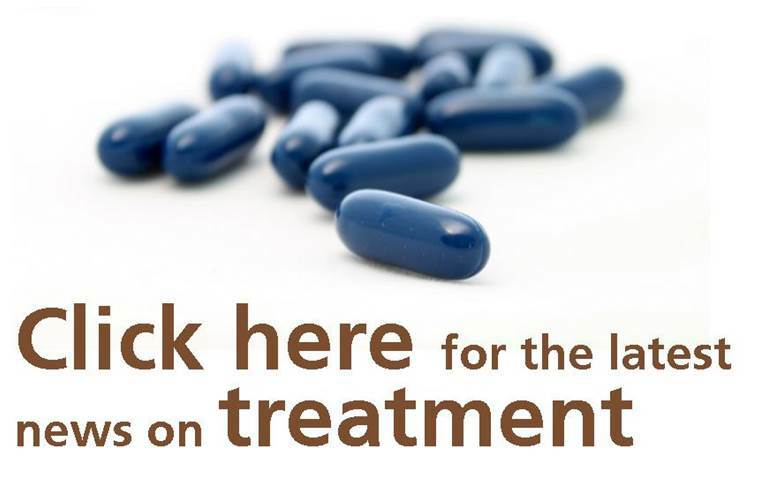 Hepatitis C treatments are changing, but treatment has included several different drugs, including interferon. If interferon is part of the treatment, it means taking pills at specific times every day as well as a once a week injection. Treatment with interferon may cause side effects so close monitoring by a health care provider is necessary. About 70% of people who complete the course of treatment are cured. Cure rates with new treatments can be more than 90%. What are these new treatments? But, approval for medical coverage for these new drugs is happening at different times in different provinces. Speak to a health care provider to find out what is covered in your province. from getting hepatitis C again. Only protecting yourself from contact with blood will protect you from getting a new hepatitis C infection. Protecting yourself from contact with blood will also decrease the chance of getting other blood-borne infections. But, keep in mind that some infections, like HIV and hepatitis B, are passed through blood AND other body fluids. Check with a health care provider to discuss if you need treatment, when is the best time to get treatment, as well as other treatment options. the type of medical insurance coverage you have. If you are not covered through private insurance, coverage will depend on the province in which you live. It is very important to talk with your provider about drugs or supplements that might interact with hepatitis C treatment drugs. Some drugs, herbal or traditional medicines, when taken with hepatitis C treatment drugs, can cause serious reactions or lower the chance that the hepatitis C treatment will work. It is important to speak with your health care provider to find out what drugs need to be avoided because this will depend on the type of hepatitis C treatment you get. People often make many changes before and during treatment. For example, they might gain support networks of friends and health care providers, or make changes to diet and physical activity. But what will happen after treatment ends? Will my care team change? Will I need to change my supports? Am I emotionally ready if treatment doesn’t work? If treatment does work, will I feel better right away? 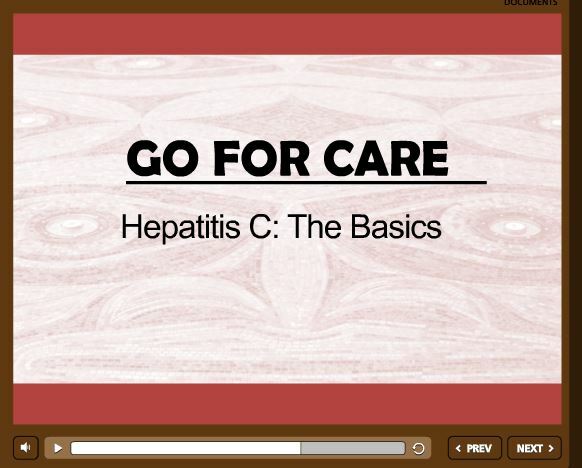 This course contains basic information designed to help people manage their self-care, whether they are at risk for hepatitis C, newly infected, or have lived with hepatitis C for many years. 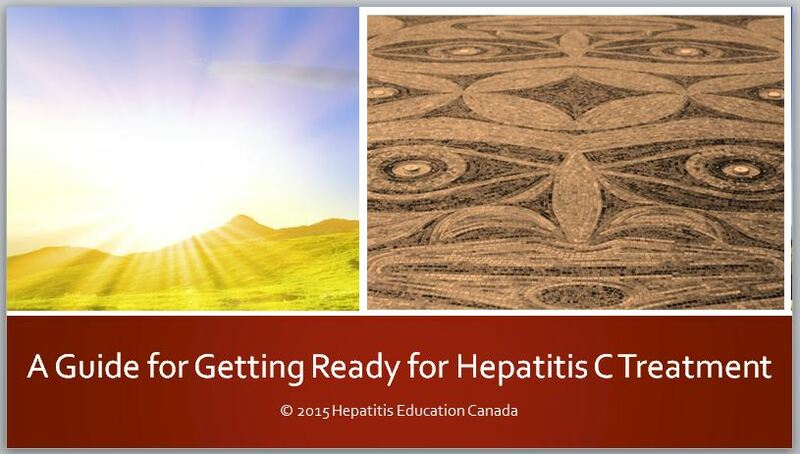 We have also heard from health care providers that Hepatitis C: the Basics provides a good basic introduction and overview for providers new to the field of hepatitis C.
2. Click "REGISTER FOR CREDITS" and follow instructions. Activate registration through the e-mail you receive.